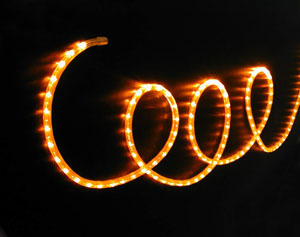 Wide Loyal Rope Light(Flexilight) can be made into any shapes, patterns or signs. With the support of a comprehensive set of accessories, Flexilight can be installed with ease in any way, namely a straight line, a curve, a segment, etc., and in any place, namely a wall, a building, a tree etc., It is user-friendly and economical to install. Its freedom of design also makes it suitable for many different kinds of decoration. 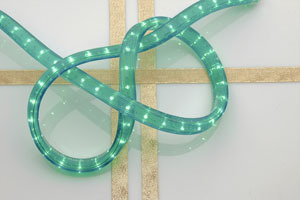 Wide Loyal Rope Light(Flexilight) is pressure resistant, UV-resistant and water-proof. Its temperature sustainability is from -50 to 105 centigrade, Its toughness enables it to be installed in many different environment, indoor and out door, on a building or baling a road etc. The average life span of Flexilight is 35,000 hours. With the double protection from Fuse-bulb structure, Flexilight is undoubtedly a reliable decorative lighting product, which application is flexible and maintenance cost is relatively low. (Fuse-bulb is available in 110/220V). Bulbs are complete embedded in the PVC coating of rope light. With appropriate accessories and correct installation, Flexilight is completely shock-proof. We also provide customers with comprehensive technical advice and installation guidelines to ensure that Flexilight is applied and installed properly. Approvals from International safety standards including CE (EMC & LVD), GS, UL, CSA and SAA (Australian safety Standard) are the concrete proof for the safety of Flexilight. Flexilight is a reliable and safe choice for decoration in both households and outdoor projects. Wide Loyal Rope Light(Flexilight) is made with miniature bulbs, which is small in size with high brightness. The average power consumption of Flexilight (220V) is 16.56W per meter, which is much lower than other traditional decorative lighting and neon light.